This article first appeared on East Niagara Post on December 16, 2014. It is repeated here as I work to put all my book reviews in one place. They will be posted on Thursdays or Fridays and only be altered from the original in that I will add publisher information and pages. Hopefully, by revisiting these reviews, other people might find a book they'd like to pick up for their own enjoyment. Good satire can grab a hold on something current and take it to its illogical, extreme outcome. Along the way, while poking fun at their subject, a good satirist spins a tale just believable enough to make the reader stop and say, “Wait! That could really happen!” The Little Green Book of Chairman Rahma accomplishes exactly that. This novel was written by Brian Herbert who is the son of Frank Herbert, author of Dune. Imagine a future where one of today’s hot button issues has been addressed and taken to this illogical outcome. In this case, it’s the green movement and global warming. Thirty years into our future, a revolution has taken over the American continent. 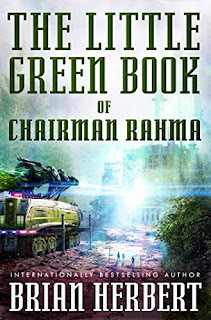 After a Corporate War where corporations were dismantled and outlawed for their danger to humanity, and Chairman Rahma Popal assumes supreme leadership of a newly formed, green government. As part of Popal’s victory, the citizenry of the Green States of America is herded into reservations and the old cities abandoned. After the people have been relocated, a team moves in to rehabilitate the urban centers back to nature. A huge contraption, called the Janus Machine, is deployed. This machine has two barrels. The first, de-atomizes the concrete and steel structures left behind. The second is a green-forming weapon to reseed the area back to its original wilderness. While there are several of these machines are engaged all across the continent, the team of Kupi Landau and Joss Stuart are the focus of the story. Sometime lovers, the teammates work together the bring North America back to the virgin wilderness that would return natural harmony to the planet. Unfortunately, a terrible accident with the Janus Machine leaves Joss injured and something no longer quite human. Chairman Rahma has Stuart hidden away from the public to endure a series of tests. It is during these tests that Joss discovers the new powers that come with his altered DNA. These powers both terrify and excite the Chairman. Could he be the next step in human evolution -- a hybrid between humanity and the natural, green way of which Rahma could only dream? Or will he become so powerful that he could usurp Rahma? Behind all Rahma’s continuing betterment for the environment is a group of rebels trying to overthrow the Chairman’s totalitarian state. The same scientists who developed the Janus Machine have decided that Rahma has taken the anti-corporate, green revolution too far. They conduct guerrilla attacks against the terraforming efforts. When Joss escapes from the GSA’s medical prison, he takes refuge in a pocket of hidden rebels outside the reservations. Meanwhile, Rahma’s Green Dream slowly begins to crumble under closer scrutiny. 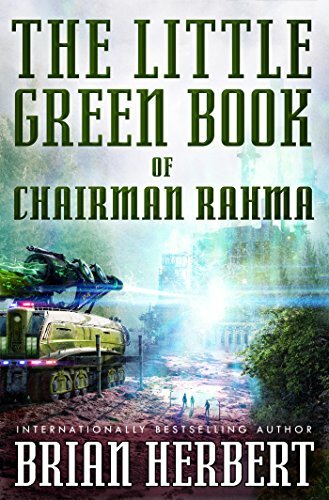 With The Little Green Book of Chairman Rahma, Brian Herbert explores what happens when a one-sided victory is earned for a single issue and carried beyond its logical conclusion. Herbert has created a world where finding a middle ground is considered weak and dangerous. Instead, in his creation, the country is run by zealots with no room for differing opinions. It's a dangerous precipice for any country to balance. Any totalitarian state, no matter how beneficial its intentions, will be the focus of revolutionaries. Remembering that this is meant to be humorous, Herbert’s characters are sometimes over the top stereotypes. One needs to keep that in mind as they read this. While the outcomes shown in this novel probably aren’t likely, the author does a fine job revealing what could happen if we continue to strict ideologies with no room for compromise to continue unabated. This novel is fine example of satire as well as a warning to us that there is a danger of not looking beyond our own blinders. I have read many of Brian Herbert’s books, all from the continuation of his father’s Dune series. This book is in an entirely different vein than those sometimes drawn out operatic novels. The Little Green Book of Chairman Rahma is high on my list of his works. The plot moves along at a fast clip and the humor, while subtle, still grabs the reader’s attention. This one was well worth the time to read. I sincerely hope that Brian Herbert continues to dip his toes into writing outside the Dune universe. So far, it has been great. Craig Bacon loves dystopian novels. Add in good satire, and it's a recipe for greatness.